The sun had set in behind the hills across the eternally flowing Ganges. There was a distinct smell in the air. I couldn’t figure out what it was; but I would have loved had it been with me forever. After the day long wandering in the jungle in an open Gypsy I dropped in at GMVN Guest House in Chilla where my car was parked. But what I saw sent a shiver down my spine! In the middle of jungle, the rear tyres of my car were almost flat. 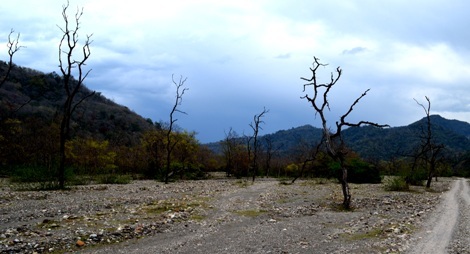 I had to return to Rishikesh before it was too dark. I didn’t want an encounter with elephants at night; neither did I want my car to get stuck in the river that flowed over the road. I had no choice but to drive down to Haridwar to get both the tyres fixed. By then it was completely dark and my car was inching towards Haridwar at a snail’s pace. There was no one to be seen and no sound to be heard around us except the continuous thud of the car engine. As the car took the right turn towards the barrage, the lady sitting next to me froze in excitement. She was holding my hand tight in awe! A long quadrupedal with a thick long tail jumped across my car and disappeared in the woods. I pressed the brake and brought the car to a halt. It was a full-grown leopard! Surprisingly, it was the same place where I had spent more than two-hours watching birds. With memories of that eventful evening I come back again to Rajaji National Park that spreads over 820 square kilometer of area in Uttarakhand and marks the north-western boundary of Asiatic elephants and tigers in India. The park represents a distinct Shivalik ecosystem. But what makes it even more different is the majestic Ganges with its innumerable young and playful tributaries that cut through undulating forest track, hilly terrain, lush green valleys, dense forests, and sprawling grasslands. On entering into the periphery of this beautiful jungle from the check post of Chilla Range near Chandi Devi Temple the speed of my car is involuntarily reduced to 10 km per hour. In the early morning mist, the sun-rays filtering through the thick foliage are creating a hypnotic collage of various shades of green. The thick, tall grasses drenched with dew are glistening in the winter sunshine. They are so tall that they can hide anything, barring elephants. A little far away just after crossing over a small brook lays an open swampy area where a herd of spotted deer are having their early morning feast. The entire landscape is simply breathtaking! The next morning, I wake up at 4:30 am. I must admit I couldn’t sleep the whole night in anticipation of going deep into the jungle—the core area of Rajaji National Park in Chilla Range. It’s early morning and the wind is a little cold and moist. Luckily we are the first ones to enter into the forest. There is a complete disconnect between the world, that lies here—in the middle of the jungle and the world that is outside, in the city—highly artificial. A little ahead after 500 meters our 4×4 vehicle takes a left turn. Yet we haven’t sighted anything except a peacock at the entrance gate. The jungle becomes denser and path which we have been following turns into the trails marked by earlier vehicles and forest rangers. Our vehicle moving slowly is brought to the halt. Aalam, the driver turns off the engine. Barely 20 meters away from our jeep, a leopard missed its hunt and within fraction of seconds disappeared in the woods. The young spotted deer looks dazed and bewildered, but it has survived. We move on. After a while our vehicle descends into the flat and open area that has been cut by several streams and dominated by towering grasses. Even though it has been more than three months since the monsoon retreated, the land is still wet and swampy, inviting herbivores to feed on soft and tender pasture. Spotted deers, sambhar and wild boar give us enough time to take their perfect shots. After over 30 minutes of slow and steady drive in this part of the jungle, our vehicle begins a sharp ascent where driving becomes difficult as the trail was badly affected by the heavy rain this season. In some part it is totally absent and managing the vehicle is quite difficult. But Aalam has done a wonderful job. He has brought us to a different world now—unlike open grassland, here the jungle is extremely dense and nothing is visible beyond a limit. It looks as if the trees were weaved together allowing nothing to go inside it—nothing that doesn’t belong to this forest! Aalam stops the vehicle for a while and tells us that this is the area where tigers are seen. I never insisted on him for tiger spotting, for I have always believed there are many more beautiful things in this jungle to watch out for. Before coming to this forest, I checked for the fact if Rajaji National Park had tigers? I got mixed responses on the Internet. 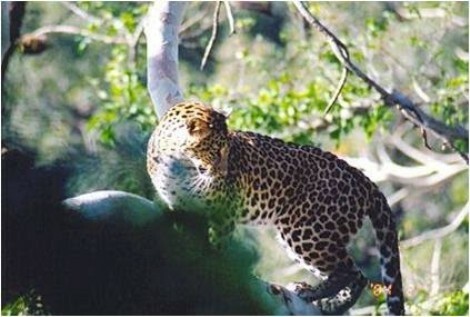 According to a report appeared in The Times of India, Rajaji National Park had 11 tigers in 2009. A reputed travel magazine on its website suggests that the park has 32 tigers (which is really difficult to believe). I also spoke to a forest official who told me that there were five tigers but they were rarely seen. Interestingly, the guides, hotels and the people organizing jeep safari never promote this National Park as a tiger reserve. It is often sold by tour organizers and travel companies as one of the best places to spot Asiatic elephants. Again we are back in a swampy river bed dominated by tall green grasses. But this is other one. At a distance we can see a herd of elephants moving away from us. But they are too far to be captured in the camera. After more than two and half hours of exhilarating drive through majestic landscapes watching beautiful life forms, we come out of the Chilla range of Rajaji National Park at around 10 am. Run in association with wildlife experts, ornithologists and WWF, Camp King Elephant is an ideal place for stay to enjoy the diversity of this beautiful national park. Guest House at Chilla run by GMVN is another wonderful place. 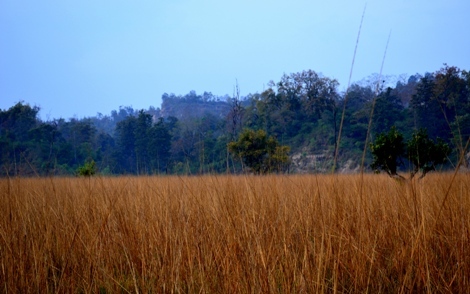 It is located right at the entrance to Rajaji National Park at Chilla. Set amidst the beautiful valley of Nalani and surrounded by forests and streams, Wild Brook Retreat is another great place to unwind. 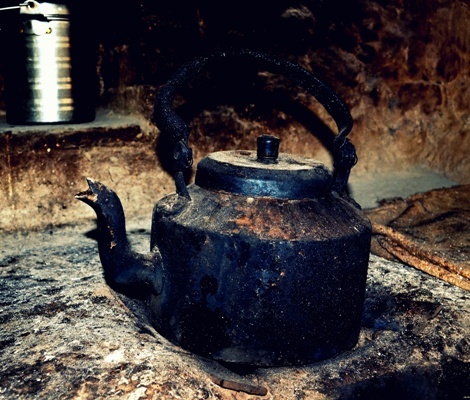 It has spacious cottages and deluxe tents. Indira Gandhi Airport is the closest International airport. Domestic airlines fly from Domestic Airport in Delhi to Jolly Grant Airport in Dehradun. 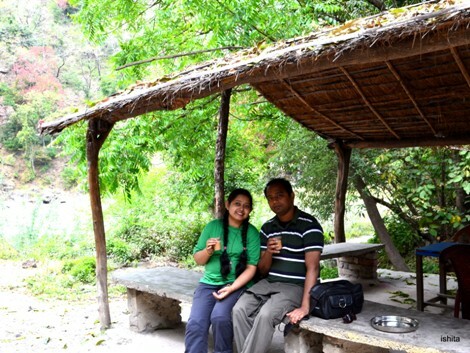 Ramgarh and Mohand Gates of Rajaji National Park are located 14 km and 25 km from Dehradun respectively. Haridwar is the closest railway station from RajajiNational Park. Chilla, Ranipur and Motichure Gates of Rajaji National Park are only 9 km from Haridwar. There are a number of trains from all parts of countries for Haridwar and Rishikesh. From Delhi it is a comfortable 5 hour drive through Meerut, Muzaffarnagar, Roorkee and Haridwar. The vicinity of Gangabhogpur as a feast for our eyes and lungs seem to be amazing.The narrative lucidity gifted us a chance to have real glimpses from the park.Sheer reading pleasure.